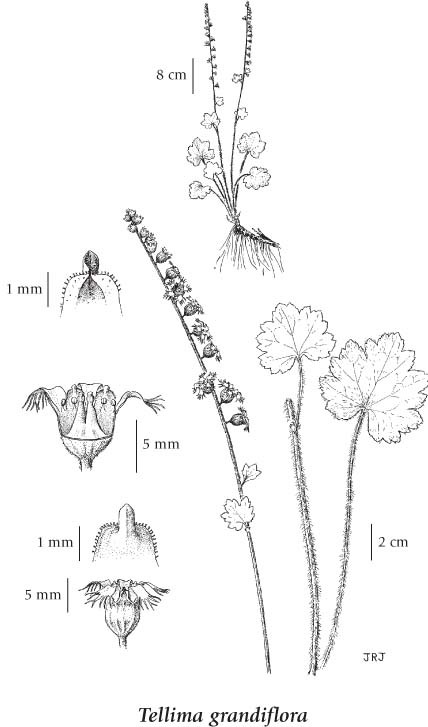 Perennial herb from scaly rhizomes; flowering stems 40-80 cm tall, with a few leaves, strongly long-hairy below, becoming more glandular-hairy above. Basal leaves heart- to kidney-shaped, 3-8 cm wide, about as long, shallowly 5- to 7-lobed, irregularly toothed, the stalks 5-20 cm long, strongly long-hairy; stipules about 5 mm long, membranous, fringed to toothed; stem leaves similar to the basal, 1 to 3, reduced. Inflorescence a many-flowered, spike-like, terminal cluster, generally 1-sided, with scale-like bracts; flower stalks 2-5 mm long; petals greenish-white to rose, 3-7 mm long, pinnately divided at tip into 5 or 7 linear segments, short-clawed, deciduous; calyces greenish, 6-8 mm long, to 11 mm in fruit, joined partly to ovary, hypanthium tubular bell-shaped, longer than joined portion, the lobes triangular-egg-shaped, 2-3 mm long, erect; stamens 10. Capsules, about 4 mm long; seeds brown, 0.8-1 mm long, wrinkled-warty in lengthwise rows. Moist forests, streambanks and thickets in the lowland and montane zones; common in W and E BC south of 57degreeN, mostly absent from central BC north of 51degreeN; N to the Aleutian Islands and S AK, E to AB and S to MT, N ID and CA. A shade-tolerant/intolerant, submontane to montane, Western North American forb distributed more in the Pacific than the Cordilleran region. Occurs in cool temperate and cool mesothermal climates on fresh to very moist, nitrogen­rich soils; its occurrence decreases with increasing continentality and elevation. Frequent on water-receiving sites and sporadic on water-shed­ding sites; most common in broad-leaved forests on floodplains where it associates with Acer macrophyllum, Athyrium filix-femina, Polystichum munitum, Sambucus racemosa, Tiarella trifoliata, and Tolmiea menziesii. A nitrophytic species characteristic of Moder and Mull humus forms.